The sun shone literally on Troon Coastal Rowing Club for the second year in a row at its Regatta on South Beach on Saturday 14 June 2014. 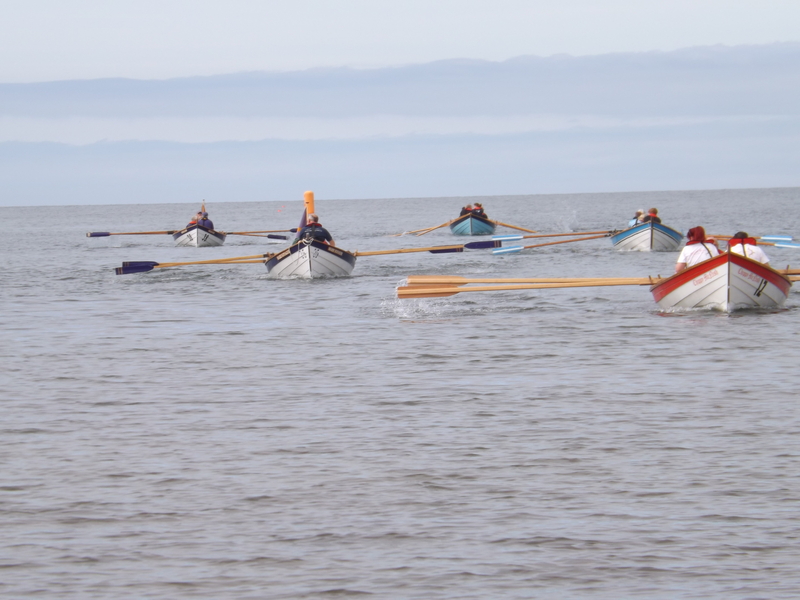 This year Troon had both its skiffs – Marr Voyager and Ailsa Lass on the beach along with identical skiffs from Royal West of Scotland, Greenock, Carrick Rowers from Maidens, Firth of Clyde from Fairlie and a visiting team of rowers from Dalriada in Northern Ireland. The Dalriada team came over by ferry and made use of one of Troon’s skiffs to compete in the race. The five colourful skiffs were lined up at the water’s edge with a large group of supporters for the first race. They then headed off on a kilometre course round two marker buoys and powered back to the finishing line just off the beach. Later in the day there were races for an older, age-limited category, again for mixed crews of men and women. All teams were seeking to win but, sadly for the host rowers from Troon, 4 of these 6 skiff races were won by the teams from Greenock (Royal West) and 2 by the teams from Maidens (Carrick). The day ended with an innovative International race using both Troon’s two skiffs. This was Northern Ireland versus the Rest of the World. The team from Dalriada represented Northern Ireland and one member of each of the competing teams was in the “World”skiff. The Rest of the World arrived back at the shore as winners in front of a great, cheering crowd. Troon Coastal Rowing Club is grateful to all their sponsers, but especially to South Ayrshire Council who supported their Regatta day so nobly.